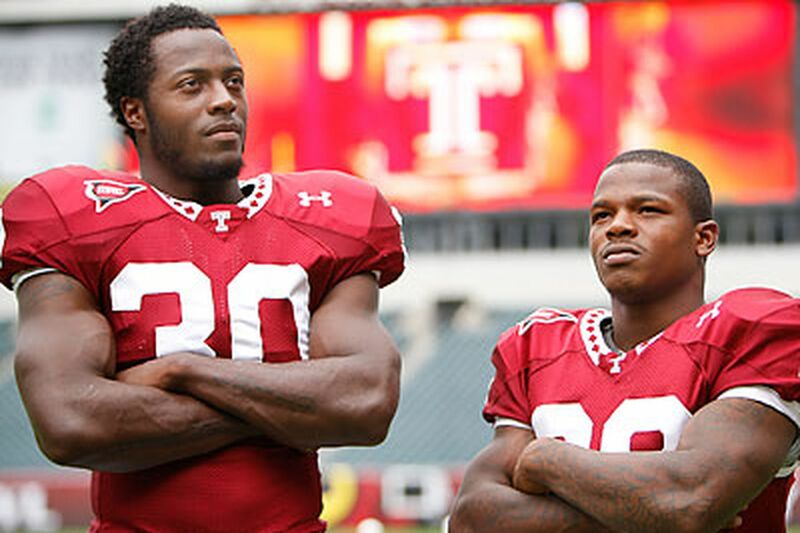 At this time last year, Temple running backs Bernard Pierce and Matt Brown were unknowns to just about everybody outside of the Owls' practice facility at Edberg-Olson Hall. By the time the 2009 season was over, however, the freshman duo had attracted national attention and been dubbed "Bernie and the Bug." "Yeah, there's competition between us," said the 5-foot-5, 170-pound Brown, a speedy native of Baltimore who joined the Owls as a walk-on. "Every day." The 6-0, 218-pound Pierce was named Mid-American Conference freshman of the year after leading the league in rushing. Had there been an award for "top replacement runner," Brown would have been a leading candidate. Brown stepped in for Pierce, who suffered a shoulder injury, in the Owls' last two regular-season outings. He rushed for 156 yards on 18 carries in a victory over Kent State. The next week, Brown came back with 172 yards on 25 carries as Temple lost at Ohio. Brown scored three times in the two games, including a 71-yard run. "I just wanted to get on the field and make myself known," said Brown, who is now on scholarship. "It felt good, but it felt like that was where I was supposed to be. I had it made up in my mind that was going to happen as soon as I was put in a position for it to happen." While Pierce wound up with 1,361 yards on 235 rushes and scored a school-record 16 touchdowns, Brown ran for 529 yards on 89 carries with five scores in 11 games. Working behind an offensive line that included four players who made one of the three all-MAC teams, Pierce averaged 5.8 yards a carry; Brown had 5.9 yards per try. Overall, Temple finished second in the MAC in rushing offense. "I used to always tell Matt that he was good and that he was going to get some playing time," Pierce said. "He really never believed me. He was like, 'Yeah, yeah.' But he stepped up big, and it doesn't matter if he goes in or I go in, it's going to be the same result." Brown, who also returned kicks last season, echoed his teammate. "I don't think about that," he said of getting as many carries as he'd like. "I just think about running. I know that he is going to play, and I'm going to play. As long as we get the W, I'm happy." Pierce, a native of Ardmore who went to Temple out of Glen Mills, accumulated his yardage last season despite sitting out two full games and the second halves of two others due to his shoulder injury. Because of a late OK from the NCAA Clearinghouse last fall, Pierce received limited reps in preseason practice and had only 13 carries in his first two games. But after rushing for 116 yards against Buffalo in the third game, he went on to finish with six 100-yard games and two games in which he gained 200 or more yards. In the EagleBank Bowl against UCLA in December, Pierce re-injured his shoulder near the end of the first half and did not return after gaining 53 yards on 12 carries with an 11-yard touchdown run. Brown had 83 yards on 20 attempts with a 2-yard score in that game. Temple did not score in the second half of the contest after taking a 21-10 halftime lead. Pierce is now on the watchlists for just about every major award that honors the nation's top running back. "To even be considered is an honor," said the shifty and powerful Pierce. "But, then again, I'm worried about this season, and I'm worried about my team. I can't think too much about myself." With Temple hosting Villanova in the Mayor's Cup at Lincoln Financial Field on Friday, Temple coach Al Golden is set to show his plan for using both Pierce and Brown. When the teams met last year - a 27-24 victory for Villanova, the 2009 Football Championship Subdivision champion - the game was decided by kicker Nick Yako's 32-yard field goal as time expired, and Pierce and Brown saw limited action. "Bernard carried a heavy burden last year," Golden said. "Obviously, it took a physical toll on him. We won't have to do that this year." Last year: 9-4, 7-1 Mid-American Conference. Coach: Al Golden (fifth season, 19-30). Top returners: RB Bernard Pierce; OL Colin Madison; OL Darius Morris; DB Jaiquawn Jarrett; LB Elijah Joseph. Biggest losses: DT Andre Neblett; LB Alex Joseph; DB Dominique Harris. Inside info: The Owls will need to do more in the passing game to keep opponents from locking in on Pierce, Matt Brown and the other running backs. Temple was 12th in the 13-team MAC in pass offense with 146.6 yards per game last season. Chester Stewart, who started seven games over the last two seasons while seeing playing time in 20 games, is the Owls' quarterback. He is a leader on the team, can run to get out of trouble and has a strong arm. Now, the 6-foot-3, 214-pound Stewart must put to use the lessons he's learned while growing into the position, and demonstrate that he can help the team get it done through the air. Last year, he went 26 for 65 for 514 yards, with three interceptions and three touchdowns. Temple's receivers combined to catch only 13 touchdown passes last year, when Vaughn Charlton started nine games and Stewart four. Wide receivers Joe Jones (28 catches) and Michael Campbell (27 catches) led the Owls in receptions and are back. Returning tight end Evan Rodriguez was third with 13 receptions. Temple has a weapon in the red zone in kicker Brandon McNamus. He made 27 of 34 field goal attempts last season and tied Pierce for a school record with 96 points. Biggest games: Against visiting Villanova on Sept. 3; against visiting defending MAC champion Central Michigan on Sept. 9; against visiting Ohio on Nov. 13. All home games are at Lincoln Financial Field.